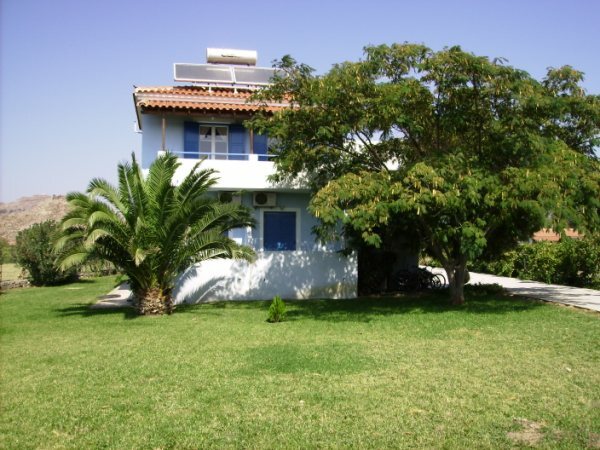 The Heliotopos provides a serine, garden setting for your vacation in Skala Eressos. From the moment you enter the garden gates you will be amazed at the lush environment in which you will find yourself. Colorful flowers flourish, lush green lawns provide spaciousness. Palm trees, pine trees and Mimosa accent the structures and grounds providing shade for the buildings as well as creating islands of comfort on the lawns. Yet there is still sufficient space for kicking a football or tossing a Frisbee. Stroll the grounds picking organic fruits directly from the trees in every season and you will understand the comment of many guest - that they feel that they have landed in a Garden of Eden. The guest rooms are to be found in two separate buildings on the grounds, each of which contain four units on two floors. All units are entered on the North side and have private balconies on the South. The first building (the blue one) has three Studios on the lower floor and a large Apartment on the upper. There is also a large common patio on the upper level with a panoramic view of the entire Eressos valley. This patio is frequently used for parties, yoga, tai chi, massage or simply relaxing. The second building (the yellow one) has one studio and one apartment on each of the two levels. Behind the back building is a large organic garden with seasonal vegetable for guests to enjoy. 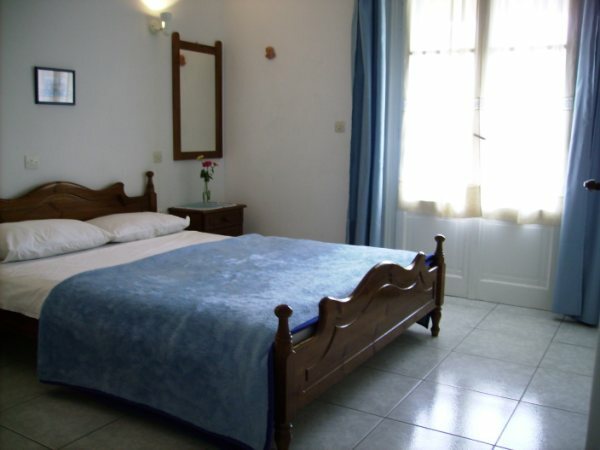 In every case, the Studios are single rooms with a double bed and integrated kitchen. They are designed for one or two occupants. Apartments all have two bedrooms, one bathroom and a separate kitchen. They will sleep up to five individuals. One bedroom has a double bed, the other has two singles as well as a pull-out trundle. 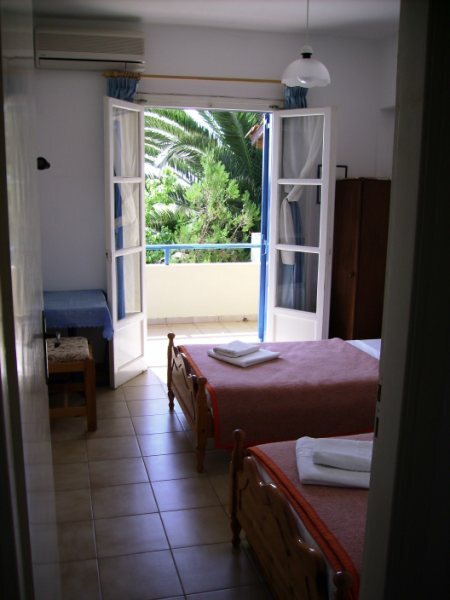 Each bedroom has a privacy door and its won doorway to the balcony. Kitchen and bathroom are both accessible without traversing the other bedroom. Indoors the rooms are typically Grecian - tile-floored, simple, spare, and clean – but also discerningly decorated and appointed. There are modern double doors connecting your bedroom to a comfortable, south-facing balcony. All balcony doorways are equipped with fly screens and rolling shutters. Kitchens are fully equipped with stove, refrigerator, sink including all dishes and equipment expected. All units have a comfortable bathroom with shower. 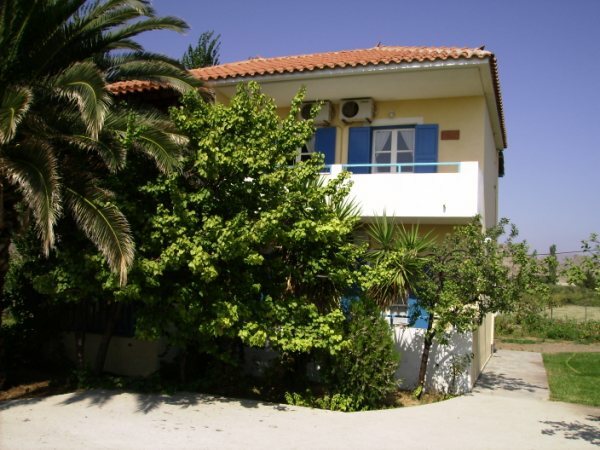 The Heliotopos is a short fifteen-minute walk to the village of Skala Eressos with its numerous taverna, shops and beaches. On the way you will cross over the renowned Turtle Pond (be sure to bring some bread to feed the turtles, fish and birds) and past the village's new children's playground. 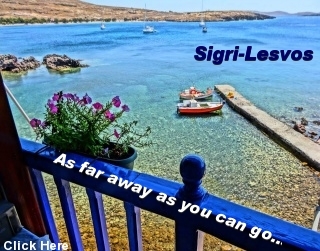 An even shorter seven-minute stroll directly south of the Heliotopos will bring you to one of the finest beaches on the Aegean, with convenient access to the famous Cantina Moon. In the evening you can have a quiet time on the premises grilling, star gazing and engaging in conversation with other guests. 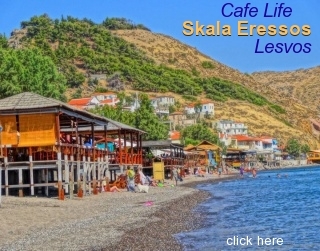 But perhaps you would prefer to venture into Skala Eressos for an exciting evening enjoying the nightlife on the decks along the beach. There you will often find live music, karaoke or cabaret for your enjoyment. It’s up to you. Your hosts, Patrick and Debby, reside on the property and are available at all times to meet your every need and provide knowledgeable advice.